When the GT 50 debuted at the 2018 Miami international show, her razor-blade sharp lines attracted crowds in droves. 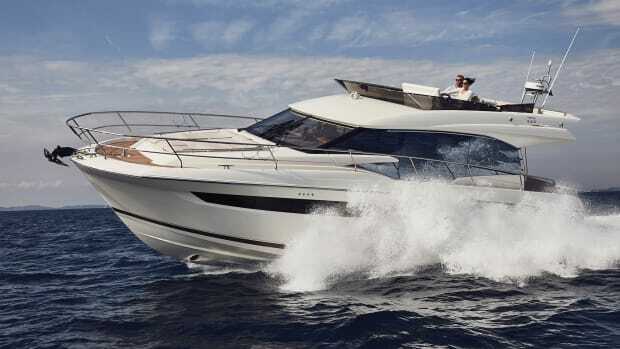 The Beneteau GT 49 was a wildly popular model for the brand, so much so that it helped to put the sporty GT line on the map, or chart if you will. And that makes sense. A number of years back Capt. 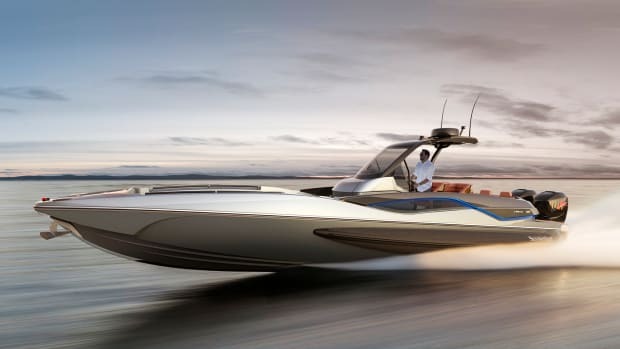 Bill Pike tested the 49 in confused 3- to 5-foot seas and found it to be a boat with a comfortable, controlled ride and a top end near 32 knots, all at the competitive price of $850,000. 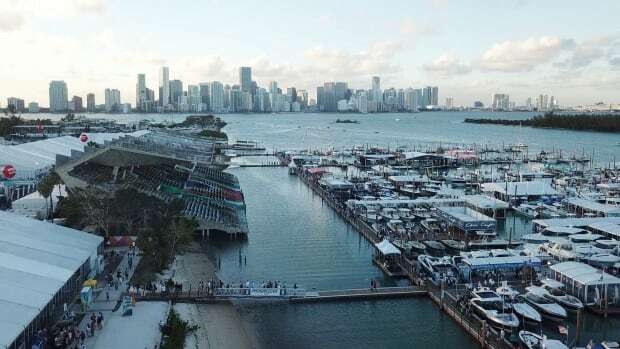 When its successor, the GT 50, debuted at the Miami international show a couple months ago, her razor-blade sharp lines attracted crowds in droves. 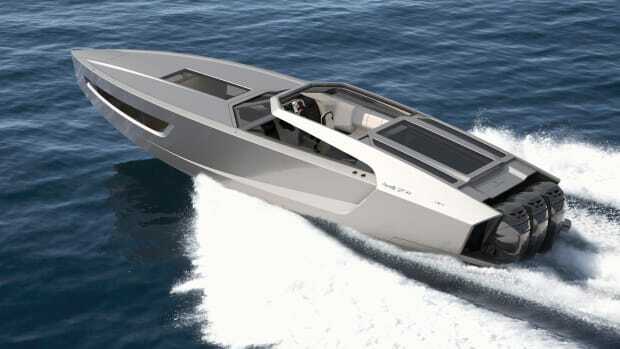 In fact, I had to arrive at the show an hour before it opened to the public to ensure I had some alone time with the new yacht. Anytime a highly popular model is replaced by a version with a similar moniker, my guard goes up. Reheated models with different throw pillows that are paraded as new boats are all too frustratingly common. 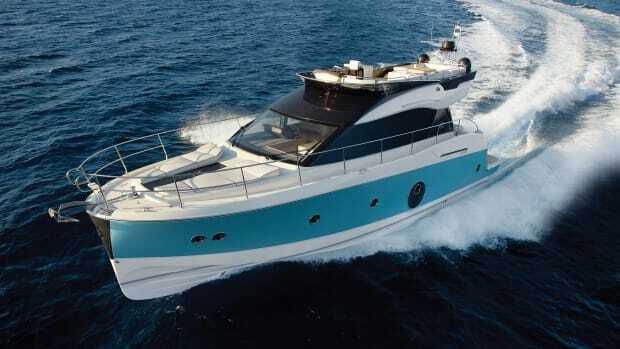 Thankfully, the Beneteau faithful can rest assured: The GT 50 is a completely new model, from its Air Step hull on up. 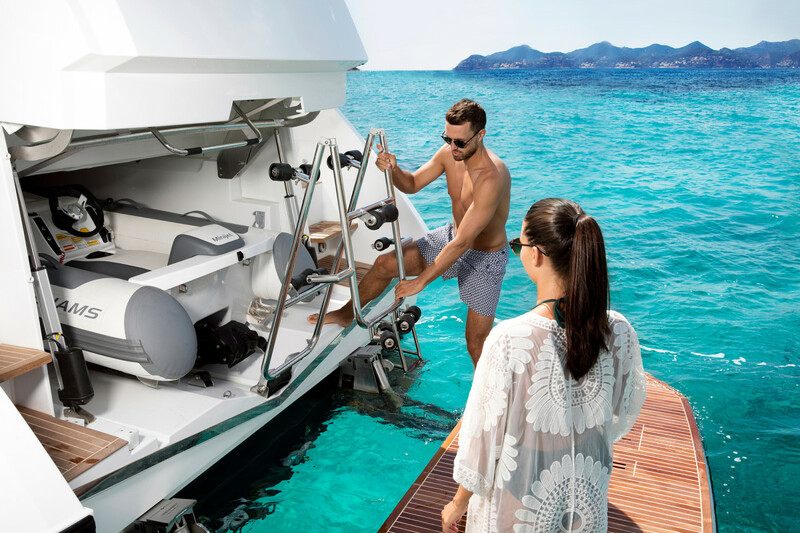 After I stepped onto the hydraulic swim platform, Beneteau’s Powerboat Sales Manager Justin Joyner opened the tender garage. The door opened surprisingly fast to reveal a Williams Minijet tender within. It’s a smart-sized tender garage, but not without trade-offs. 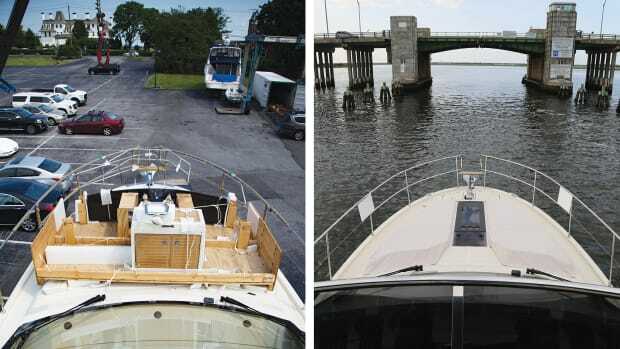 Located aft of the master stateroom, the garage steals height from the engine room. I personally had no problem getting to each service point, but some might have trouble moving about in there. 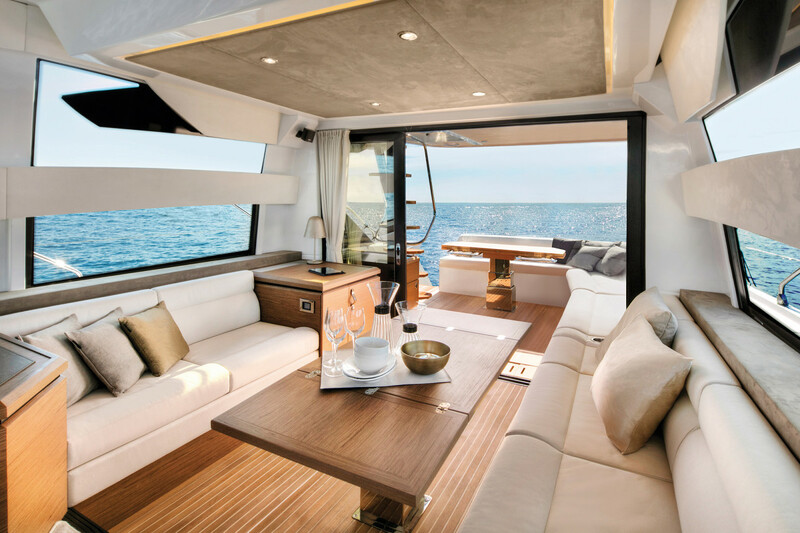 Step into the cockpit and move the salon doors to starboard and one of the more impressive features appears: an enormous—not speaking relatively here—settee that starts in the cockpit and runs along the port side of the boat through the salon. A quick estimate says you could seat 14 adults on the sofa. The forward seats are within earshot of the captain at the helm. Speaking of the helm, that’s where things get even more interesting. The wheel is on centerline, which is fairly common. 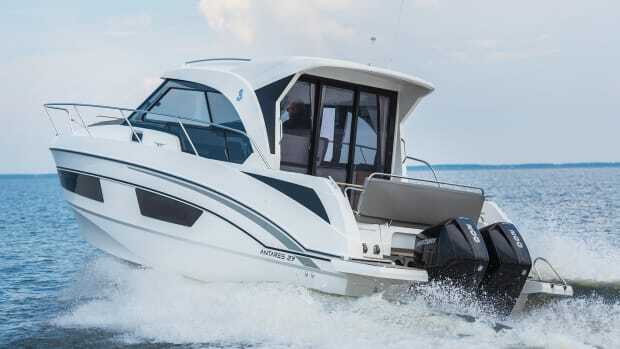 The throttle and joystick for the Volvo Penta IPS600s is to port of the wheel. That’s not common. To a lifelong-righty, it felt all wrong. Joyner suggested I stand beside the joystick and face aft as if I were backing into a slip—the time when the joystick is most called into use. I’ll admit it was an interesting exercise. Facing aft from the center of the boat, with the joystick in my left hand, backing up would feel more natural and allow me to dock while clearly seeing both aft corners. 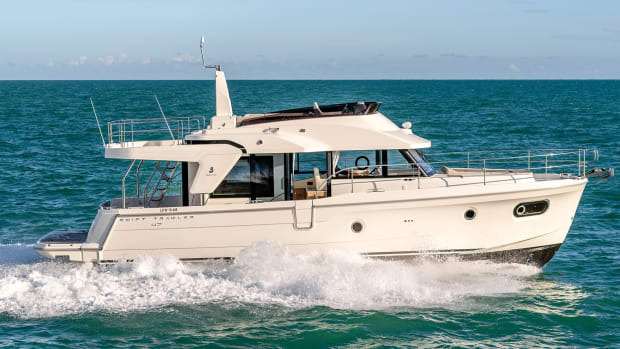 The helm of the GT 50 is the first one to house the company’s proprietary monitoring/electronic control system dubbed Ship Control by Beneteau. 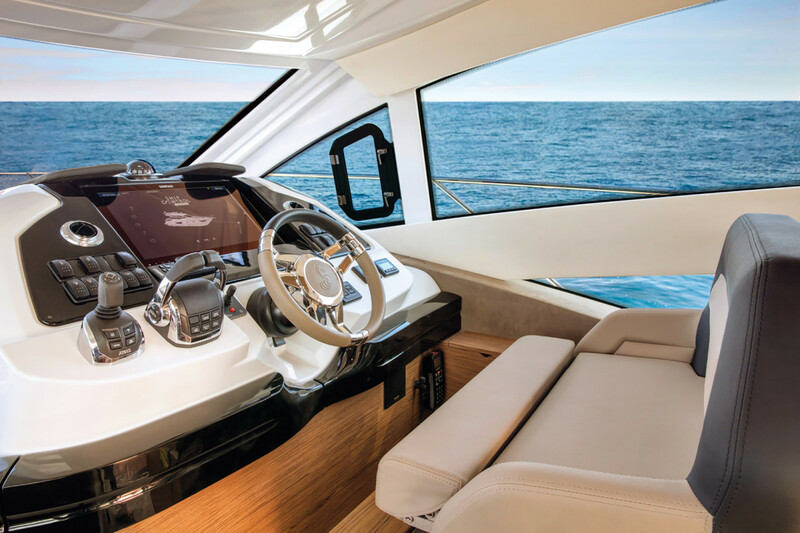 A few swipes and taps across the MFD shows that it’s exceptionally easy to use, putting the ability to control the boat’s lighting, sound system, air-conditioning, and much more at your fingertips. 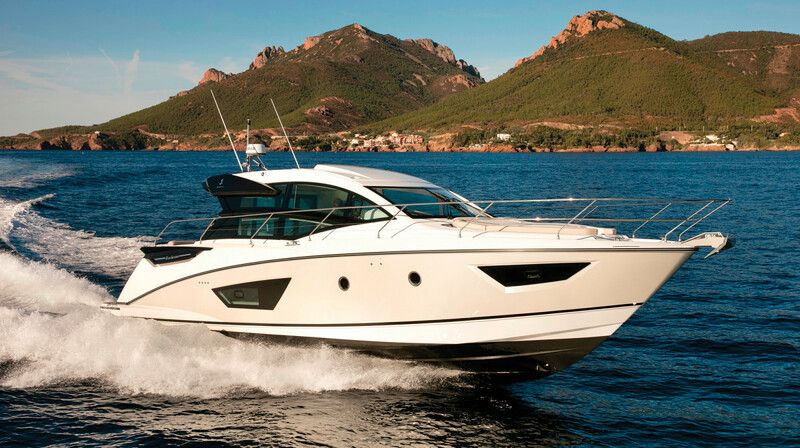 Look for this system to be rolled out through the rest of the Beneteau lineup. Belowdecks the 50 comes in a two- or three-cabin layout with the galley down. 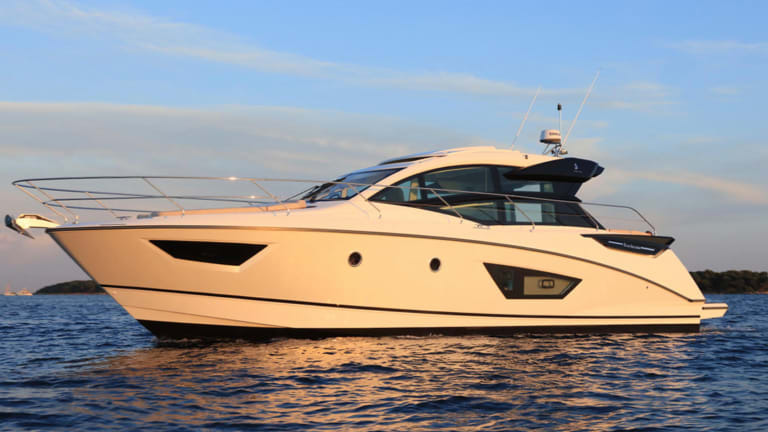 The staterooms and styling are all highly contemporary. 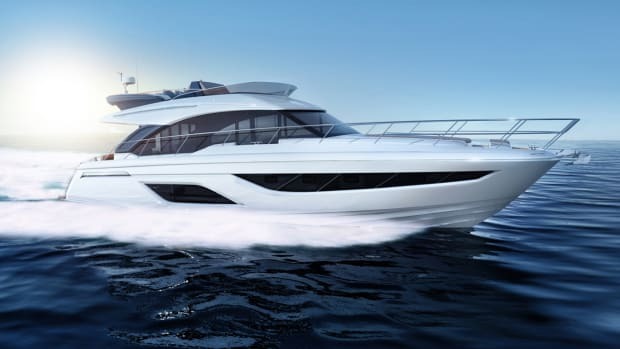 On the GT 50 I found modern updates, a proven propulsion package and hull form, as well as a lights-out debut party in Miami. It’s early, but this all points to another home run model for this builder.